One of our visitor Mr. Sanjay Kumar has asked this question to us. He said that he previously used luminous tubular battery for 800 va inverter and it lasts for 31/2 years and now he needs a suggestion from us in choosing the right Tubular battery for his 800 va inverter. He already said that his luminous Tubular lasts for 3.5 years. So, we recommend Exide 150 AH invatubular for his 800 va inverter. As per our experience, a well maintained Exide Inva tubular will last for 5+ years. 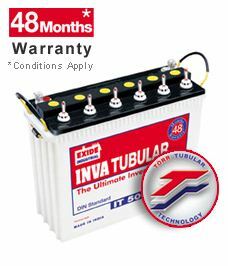 So, it’s wise decision to choose exide inva tubular battery. UPDATE: For more on Luminous Tall Tubular Battery Models, Read the following two Posts. How to Choose Tubular Battery?